Danica Firulovic (b. 1987) is a Sydney-based artist, represented by Galerie pompom. Restrained, reserved and quiet, Firulovic's work articulates overtones of white to create compositions that are obsessive of repeated forms. Through the delicate execution of layering white, the lyrical works embrace symmetry to suggest a geometry of the senses at its most tranquil and un-disturbed. 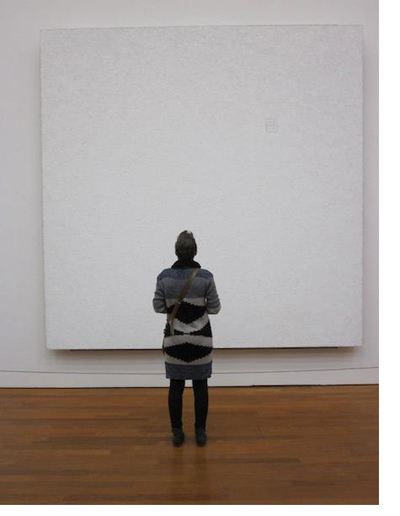 The subtle white layers painted on linen, which become visible at close range and can disappear entirely when photographed, require pa-tience and slow engagement of the audience. Simultaneously, the work questions the placement and meaning of a painted surface, and what it means to steadily engage with it, in a fast-paced digital world. Therefore, the complexity of the work lies in its simplicity, as they do not aim to cap-ture reality or represent the real world, but instead attempt to evoke con-templation and emotion of the onlooker. In 2009, Danica completed a Bachelor of Fine Arts/Arts at the College of Fine Arts (COFA), now UNSW Art and Design. In 2010, she completed a Diploma of Education and returned to UNSW Art and Design from 2012 to 2013 to complete a Master of Art Administration, undertaking internships in public programs and registration. Firulovic has exhibited in selected group exhibitions in Sydney, Melbourne and Hong Kong and has been a finalist in various art prizes, including the Brett Whiteley Travelling Art Scholarship and the Hornsby Art Prize. Her paintings are in private collections across Australia, New Zealand and the US.